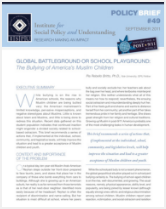 While bullying is on the rise in American schools, the reasons why Muslim children are being bullied vary: the American mainstream’s limited knowledge, pervasive misperceptions, and negative stereotypes about Muslims. Little is known about Islam and Muslims, and little is being done to redress this situation. Recent data gathered on this student population indicates that continued inaction might engender a divided society related to schoolbased ostracism. This brief recommends a series of actions that, if implemented at the individual, school, community, and legislative levels, will help improve the situation and lead to a greater acceptance of Muslim children and youth.